I was in a Texas - Houston and Austin - to be specific, on business travel last week. It's probably not shocking that I capitalized on this opportunity to find some of the tastiest bits of both these cities, and put them in my belly so I could tell you about them. In Houston, my favorite supper by far was taken in the enchanting, candle-lit courtyard of Hugo's, which specializes in authentic, delectable, regional Mexican cuisine. 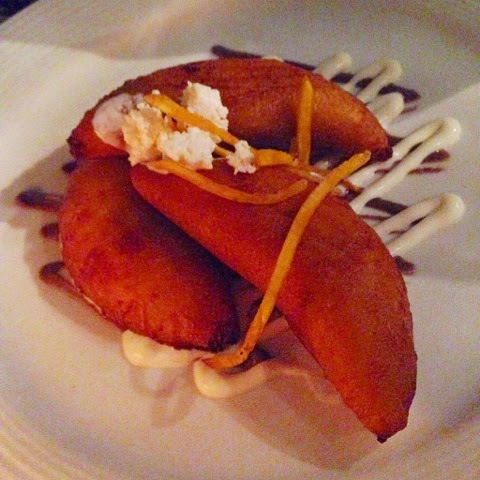 Nary a burrito or gordito on this menu, but the refried black bean-stuffed empanadas made from plantains were lightly crispy, wholesome, and just sweet. The plantain dough fried up light and airy, while the earthy frijoles grounded that slightly sweet flavor, and the crema and queso fresco on top provided a little selenity and a cooling creaminess. 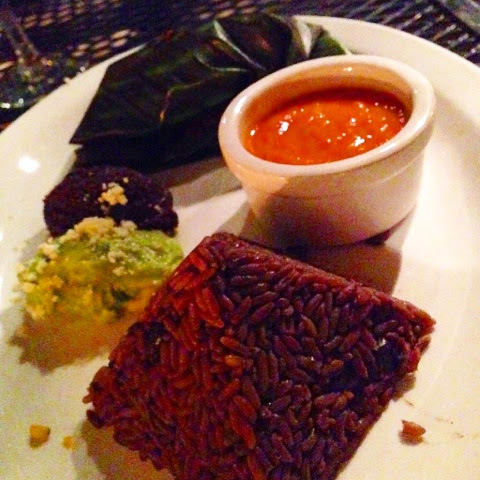 Even better was my entree, cochinita pibil, or suckling pig braised and wrapped in a banana leaf. It was served with black rice, an al dente, slightly crunchy, non-sticky starch, and a scorching habernero salsa that was best employed sparingly, and with a big mouthful of tortilla. The pork was cooked down perfectly, not fatty but plenty tender and juicy, the moisture preserved in its leafy wrapping. The service at Hugo's was courtly and attentive, and everything from the hostess' welcome to the cinnamon-laced coffee I enjoyed with dessert, was splendid. This is a Houston highlight, to be sure. Another bright spot in downtown Hpuston is Bryan Caswell's Reef, a cool, modern seafood house with more of the same friendly-yet-refined service I had found at Hugo's, but a more modernist approach to the food. 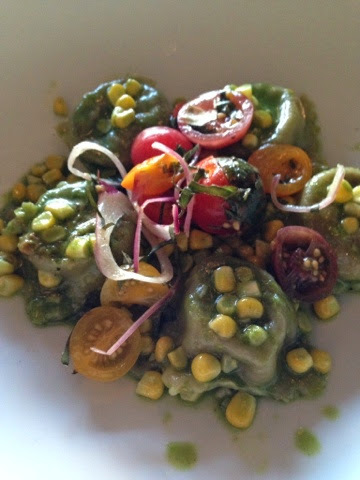 The fresh corn ravioli with basil sauce (not pesto) and tomatoes was gracing its last evening on the menu, and we rescued it, savoring its final breath of sweet summer and robust, bursting flavors. 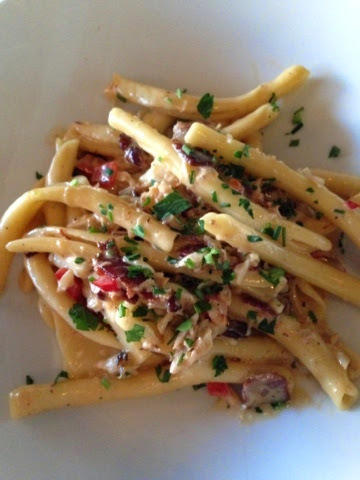 I arrived intending to consume the crab carbonara, and I enjoyed it immensely. The crab was clean-tasting and not overpowered by the dish's bacon or peppers. This was far less eggy and cheesy than a traditional carbonara, but again, an old school preparation would only have drowned out the crab's glorious flavor. This lighter sauce was apropos and quite yummy, and the sturdy strozzapretti pasta it enrobed was hearty enough to compensate for the ethereal pleasures of its dressing. 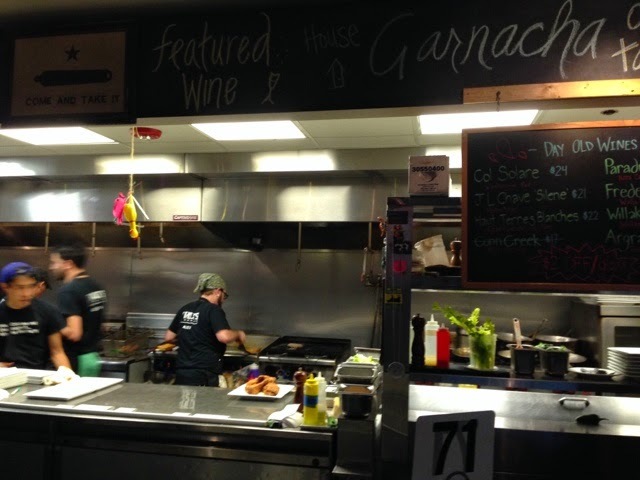 Once in Austin, after an excessively early flight and a long day at work, I was too weary to seek out a food adventure in this tasty town, but I managed to return to an old favorite: Max's Wine Dive. This visit, I took advantage of Max's famous fried chicken and champagne combo. But first, the epic pan borracho, or drunk bread. This, my friends, is the best damn holiday dressing you will ever consume. 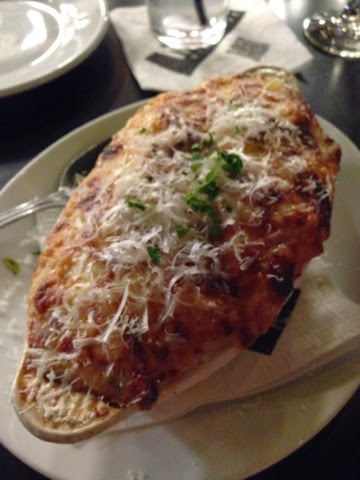 A heady mix of sourdough, white wine, gruyere, prosciutto, and provolone - a savory bread pudding, tangy with wine, luscious with a mix of cheeses, and enriched by the salt of the prosciutto - it was absolutely dreamy. I will be tinkering with a rip-off recipe of this masterpiece, so come on over if you fancy a taste! And then, yes, oh yes, fried chicken. 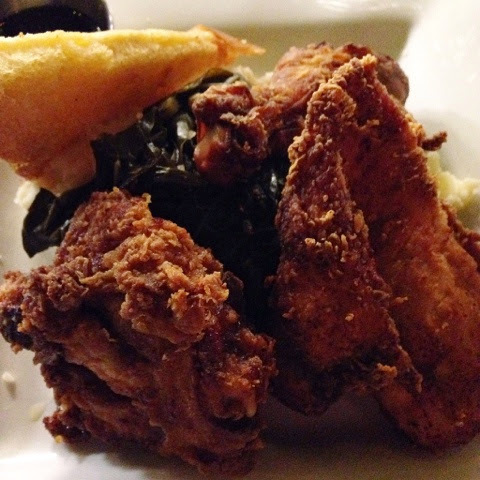 A heaping plate of mashed potatoes, collard greens, and three pieces of brined, crunchy chicken was over-the-top decadence, and no, I did not polish my plate, but oh did I enjoy the attempt! I have lots of favorites in Austin, and have reported most of them to you before, but on this night, there could not have been a more perfect, comforting meal than the one I enjoyed at Max's. I'm now happily back in NY, and heading to Watertown this weekend to meet my newborn niece and enjoy a couple North country eateries for my new column in the Watertown Daily Times. Have you checked out those reviews yet, Hungries? I hope you'll follow along this new food trail! My personality is big; my hunger is bigger!